From approximately A.D. 1200 to 1450, and perhaps even later, University Indian Ruin was a prominent Hohokam center with platform mounds. As the only Classic period center with such public buildings in the eastern Tucson Basin, this settlement undoubtedly served as the focal point for a much larger surrounding community of interrelated small hamlets and villages. Occupied from early through late Classic phases, the site encompassed residential and ritual architecture and artifact assemblages that span this dynamic interval. After a former student donated a portion of University Indian Ruin to the Department of Archaeology in 1930, a variety of archaeologists excavated in its well-preserved core, but only Julian Hayden’s (1956) work on and around the main platform mound has been comprehensively reported. 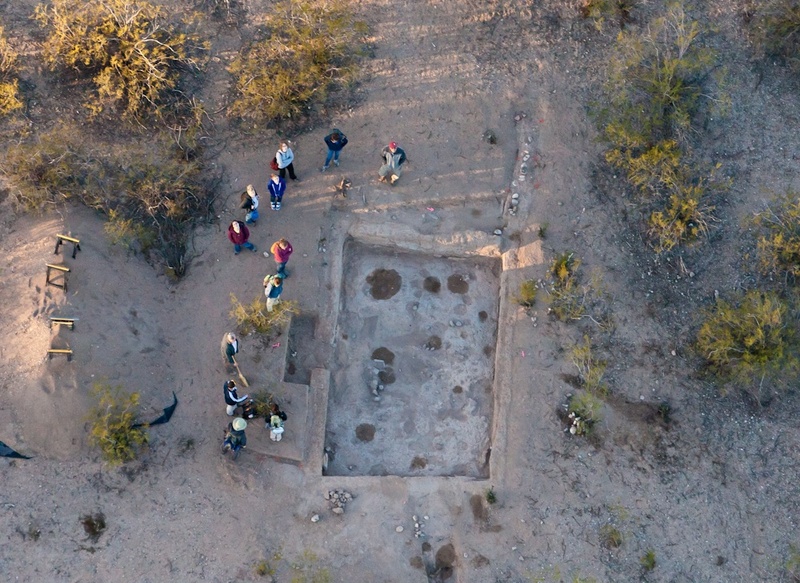 Beginning in 2010, Paul Fish and Suzanne Fish have taught the School of Anthropology’s spring archaeological field school at University Indian Ruin in collaboration with the Arizona State Museum and Desert Archaeology, Inc. Mark Elson has co-taught the field school for two years and Jim Watson for one year, with Lawrence Conyers, Douglas Craig, and Patrick Lyons as additional research principals. Results to date help evaluate the potential to integrate previous investigation with current and future research. Methods include detailed mapping, applications of ground penetrating radar, controlled surface collections, shallow wall trenching to define architectural outlines, and excavation of selected rooms. The confirmation of a second small platform mound with attached exterior rooms and the diversity of residential structures heighten an appreciation of architectural complexity during a time of population movement, aggregation, and accelerated cultural change. Differential acquisition of polychrome types, distant obsidian, exotic chert, consumption of bison, and late prehispanic pottery of Zuni and probable Sonoran origin provide new insight into Classic period regional interaction.